Very eclectic finds this weekend. Metal, Glass, Silverplate, wood, fiberglass, leather. Used Ribbet and PicMonkey for the collages. 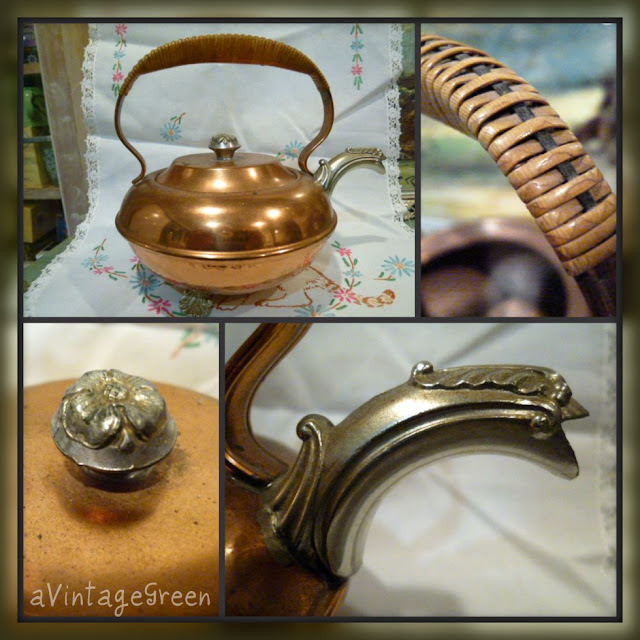 The copper tea kettle with the rattan wrapped handle and serpentine spout was from the local church sale (a surprise extra sale, they had been given the contents of two estates and instead of storing things they elected to hold an extra Men's Garage Sale on the weekend. They make it brief, 4 hours, and then they box up any excellent leftovers and store those and take everything else and divide it between all the local thrift stores. Very organized. I picked up this silverplate butter dish at the same sale. The glass insert is a round bevelled removable disk and there is space under the disk for ice. Great idea. The design on the left in this collage is the interior base where ice sits to keep the butter cool. 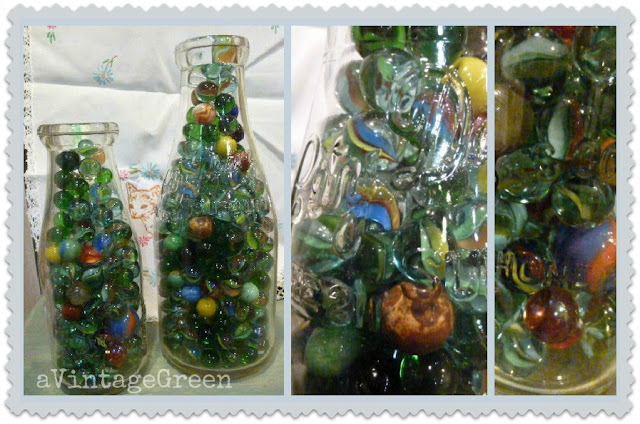 Another garage sale had a big container of marbles and I was able to fill up all my pint milk bottles and one quart bottle. Love having sunlight shine through all that glass. Back to the Men's Garage Sale - wooden spools ! Enough to fill up two pint sealers. 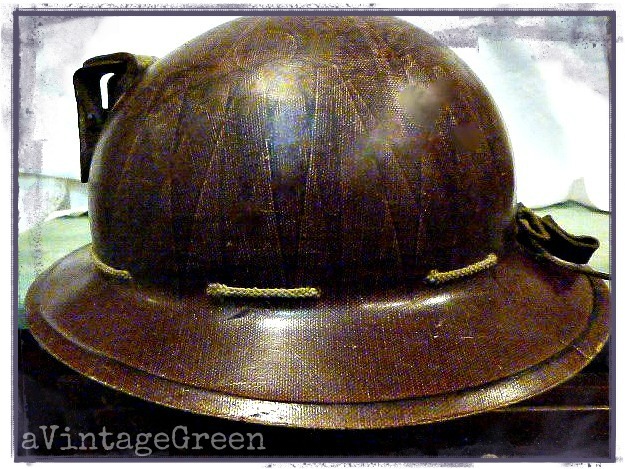 The Miner's Helmet was found at yet another garage sale. The helmet is formed from fibreglass and has attachment for mounting a lantern. The interior had all the original headband webbing. 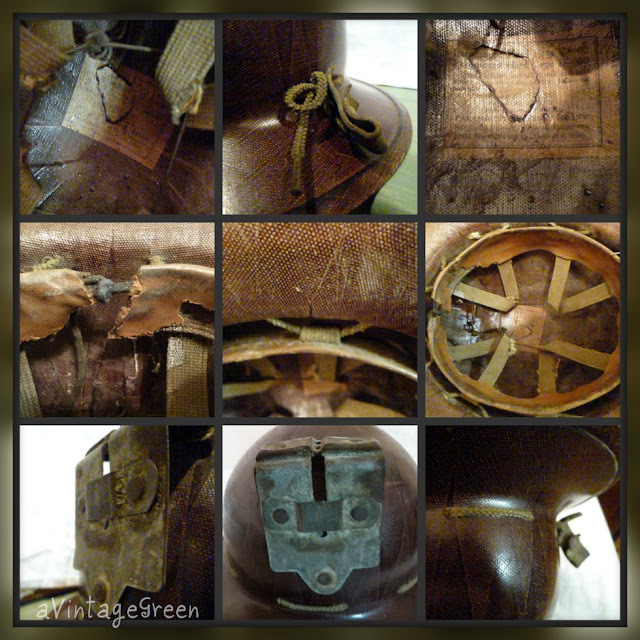 There are so many textures, contrasts and colour variations found in this helmet. I loved seeing your finds. Great fun...love the marbles in the old milk jars. 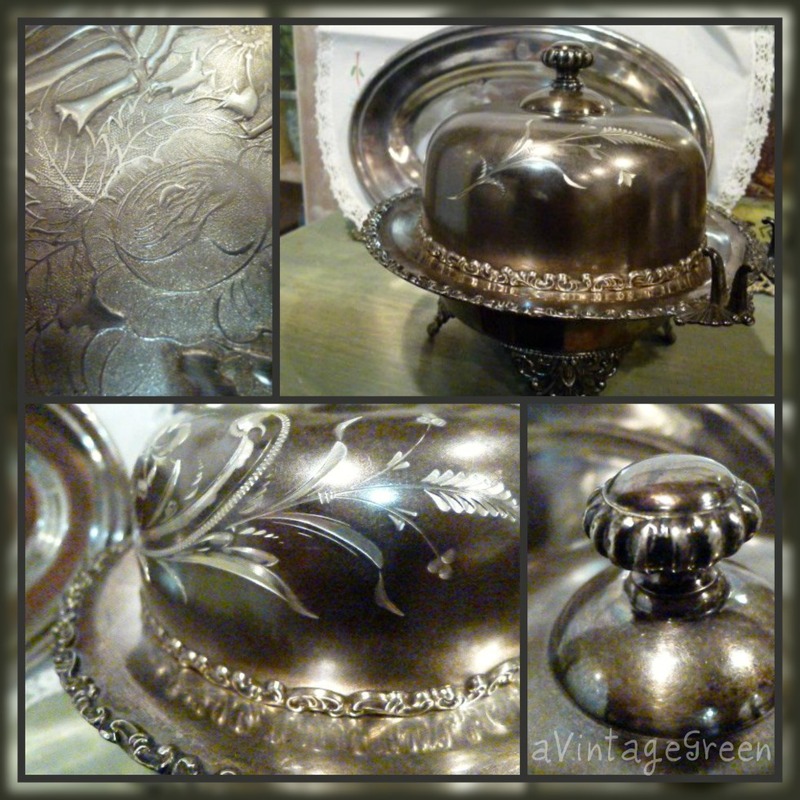 The butter dish is amazing. What a great design! Ah, marbles, I would love to find some old ones. Great finds. 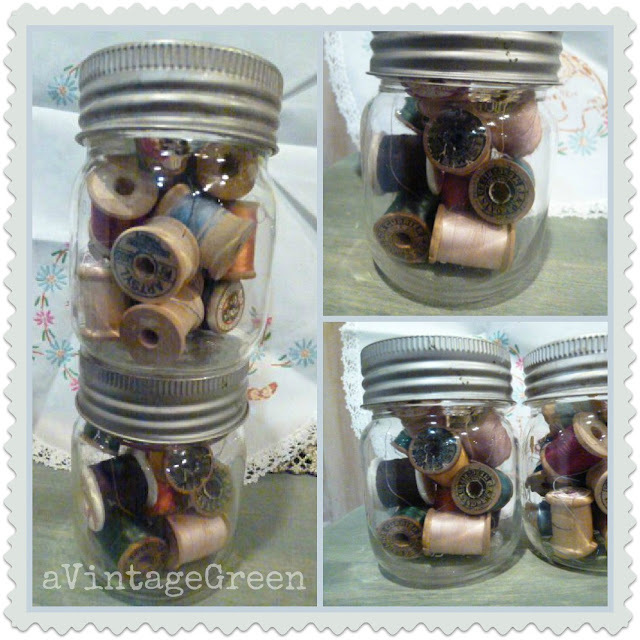 Just lucky, always looking for wooden spools, marbles, clothespins, buttons... anything that can be displayed in bottles and jars. Hey! I'm your new funny faced follower! What a fun post! I will be back to have a long look around! Loved reading about your fun finds! Hello fellow thrifter - what fun finds! Popped in from Wow Us Wednesday. hi Joy ... you have such a good eye for what shows up so nicely as collectables. Love all your 'finds' ... Pyrex is always so pretty. You found so many fun things! Love the wood spools, the way the marbles look in the milk bottles and that butter dish is just fabulous! Loving all the details on the butter dish and the tea kettle. Copper and silver are great finds. Just hate the polishing. Cheers ... visiting from Show & Tell Friday! Lady, you really scored! Esp with that miner's helmet. Good work! Great finds! I love the copper tea pot. Thanx for coming to the party!